The trapezius is the biggest shoulder muscle. It extends from the neck and chest part of the spine to the shoulder blades on both sides. Upper trapezius elevates and upwardly rotates the scapula and laterally flexes the head; the right and left trapezius together extend the neck (backward). Middle or transverse trapezius retracts the scapula (bring it close to the spine), together with rhomboid major and major. Lower or ascending trapezius depresses and upwardly rotates the scapula. Acute pain in the trapezius muscle can be caused by a contusion, strain or tear. Decreased strength in the trapezius speaks for an injury of the trapezius tendon or the related nerves (spinal nerve roots C3 or C4 due to a herniated disc). Upper trapezius. Sit down, raise the shoulders and extend the neck against the pressure of the examiner’s hand put on the back of your head. Middle trapezius. Retract the shoulder blades (bring them together) against the pressure of the examiner’s hands put near the middle borders of your shoulder blades. Lower trapezius. Pull the shoulder blades downward against the pressure of the examiner’s hands put at the bottom of your shoulder blades. 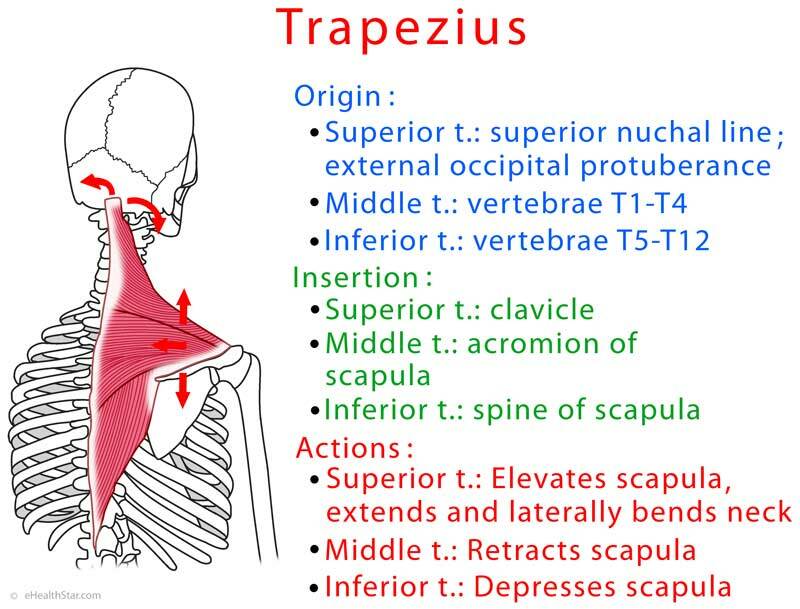 Trapezius myalgia develops due to increased tension in the upper trapezius and is more common in women than in men . Symptoms can include tenderness, pain, stiffness and tingling in the shoulders and back of the neck, nausea and anxiety . Chronic pain can become worse after a period of inactivity . Signs. A doctor may be able to identify muscle knots. Applying pressure to the muscle knots that act as trigger points can trigger a headache behind the eyes, in the temples and at the back of the head (myofascial pain) . Avoid activities that cause you more anxiety than peace. Concentrate on work goals rather on work difficulty. Three simple exercise to release trapezius pain you can due during work: shoulder blade retraction (scapular pinches), shrugging and bending the head toward the hip (Video 3). Decreased strength in the trapezius speaks for an injury of the trapezius tendon.